« Cubs heading towards the break on a positive note…(so far). Optimism is never allowed in training camp. It’s that time of year again. This time, the Bears reported about a week before other teams due to The Hall of Fame Game against the Ravens. So this just means that we will be hearing about injuries, players holding out and coaches telling the media that everyone is having a great camp earlier than usual. This is what we have been given with the Bears over all of these years. Then, when the regular season starts, it will be coaches telling everyone that “we had a great week of practice” which means absolutely nothing on Sundays (or Mondays/Thursdays). 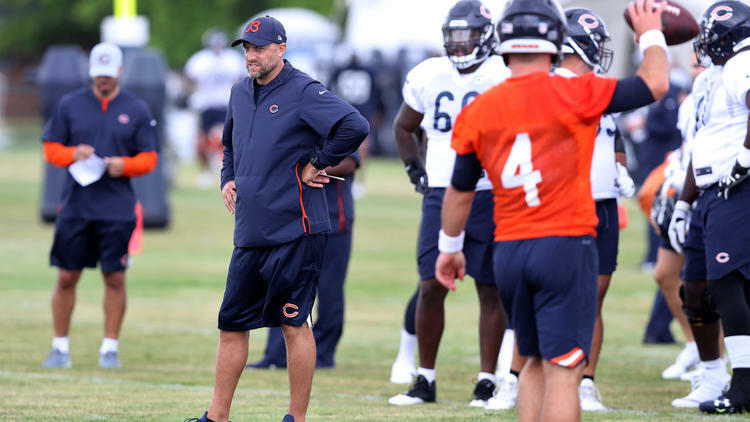 I can’t sit here and say that I have zero faith in Matt Nagy. But given the history of coaches who have come through the doors of this franchise, I have every reason to feel that way. This will sound awful, but the last couple of years, I have been forgetting a lot of players that are or were on the team during that time. This is due to all of the injuries and roster turnaround in that team. The last few years, we’ve witnessed no-name, no-face players more often than so. A lot of these draft picks had either been hurt or are no longer on the team. That’s a sign of a franchise in the cellar. First-round pick Roquan Smith has still, not signed a contract nor has reported to camp. If the Bears are going to get better on defense, this guy needs to be there and be healthy. I am certain more will be written on specific players in the next few weeks. But for now, feel free to share your thoughts. This entry was posted on July 22, 2018 at 12:34 pm and is filed under Uncategorized. You can follow any responses to this entry through the RSS 2.0 feed. You can leave a response, or trackback from your own site. Why should this season be any different? New head coach? But Pace, Phillips, and McCaskey are all still there. How can we really expect change? Smith was a great draft pick. But he is already behind schedule and missing more time before he ever steps on the field. The rest of the draft picks – who knows? 7-9…might be a wee bit optimistic. Hey, Fro, I’m thinking…sorry, I got nothin.